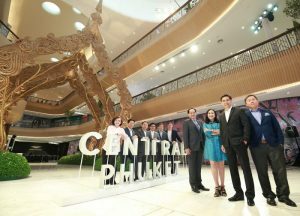 Phuket (Thailand) – September 11, 2018 (travelindex.com) – Central Pattana Plc (CPN), Thailand’s largest retail property developer recently celebrated the Grand Opening of Central Phuket, its world-class luxury flagship mall. Establishing a new ‘CBD’ in the heart of Phuket, Central Phuket is developed with a total investment of 20 billion baht which comprises of a shopping center and world-class tourist attractions, aiming to become ‘The World’s Must-Visit Destination in Thailand’. This will fulfill the shopping and lifestyle experience to establish Phuket as one of the complete ‘Beach Lifestyle Destinations’ comparable to French Riviera, Miami and Hawaii. Establishing itself as the country’s landmark, Central Phuket will be holding international events, such as Phuket International Music Festival and Phuket International Countdown 2019, throughout the year. In addition, visitors will get to experience an exclusive ‘Phuket Menu’ available only at Central Phuket where the shopping center has joined hands with popular restaurants in Phuket in order to promote the reputation of Phuket’s cuisine. Apart from gastronomy, Central Phuket is also outstanding with several exclusive unique-in-the-world attractions that tourists should not miss: Tales of Thailand – the largest indoor market reflecting Thainess lifestyle from 4 regions, Tribhum – a 3D virtual adventure in the world’s first fantasy walkthrough, which will officially open in November 2018 and Aquaria – Thailand’s newest format of aquarium which will be ready for visitors to experience the wonders of the ocean and the mysteries of the river with over 25,000 creatures in the first quarter of 2019. The highlights for the Grand Opening feature first time in Thailand world-class performances, including, ‘Star Catcher’, the innovative live 360-degree immersive theatre performance by the renowned performer from Canada, ‘Creativiva’; international street shows including ‘Bubble on Circus’, performed by artists from Italy and ‘The Balloon Show’, from Japan. The night ends with the fantastic ‘The Sealumination’, lighting up a new landmark in Phuket. Book your hotel in Phuket, Thailand and around the world in 55 countries at best rates available. Pay at the hotel. Book now at HotelWorlds.com!